Cologne - 1. 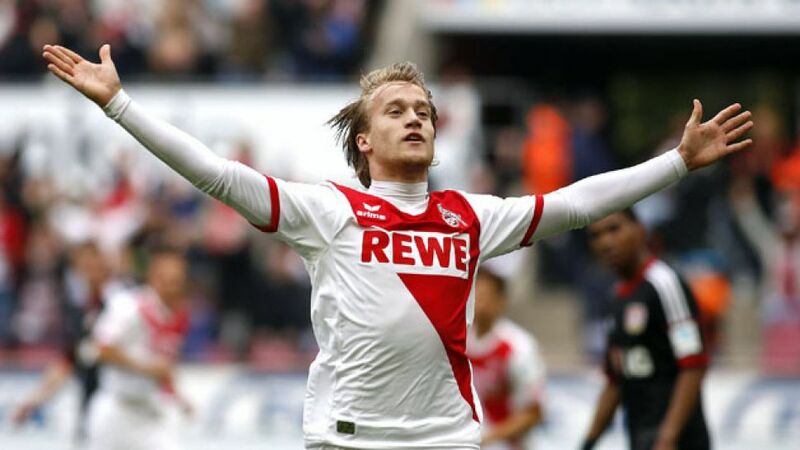 FC Köln fought back to secure a dramatic late 1-1 draw at home to Rhineland rivals Bayer 04 Leverkusen. The visitors controlled a tight first half and Timo Horn did brilliantly to deny Leverkusen playmaker Hakan Calhanoglu from the spot. Substitute Julian Brandt gave die Werkself the lead on the hour against the run of play, but Bard Finne's equaliser seven minutes from time handed Köln a deserved share of the spoils. With Gonzalo Castro out injured, Leverkusen coach Roger Schmidt opted for Simon Rolfes in defensive midfield, and the veteran’s nous was crucial as Bayer enjoyed the better of the opening exchanges. Kyriakos Papadopolous headed his side’s first chance in the eighth minute straight at Horn, while the local boy was again called into action shortly afterwards to deny Calhanoglu’s stinging shot from distance. It took 18 minutes for Köln to threaten, and when they did, Jonas Hector fired his free kick from a dangerous position high and wide. Having weathered the early Leverkusen storm, the hosts began to gain a foothold of their own in midfield, with Matthias Lehmann breaking up attack after attack. Indeed, the next best chance fell to his side, with Yuya Osako’s 29th-minute shot powerful, but straight at Bernd Leno at his near post. As the midfield battle intensified, however, chances became fewer and further between. Marcel Risse fired wide from distance as Köln pushed forward, but, in the 40th minute, the visitors were awarded a penalty on the break after Stefan Kießling was felled inside the area. Calhanoglu stepped up, but his weak effort was repelled in fine style low to his left by Horn, the keeper’s first-ever penalty save at this level, to ensure the sides remained deadlocked at the break. After Horn's heroics, it was Köln who enjoyed the more positive start into the second half. A lovely move from Yannick Gerhardt and Hector almost sliced open the visitors in the 50th minute, before Risse’s deflected cross drew a good save from Leno. Lehmann's shot then cannoned off a defender from close range, but Leverkusen hit the enterprising hosts with a sucker punch on the hour-mark when substitute Brandt finished excellently from the edge of the box. Unsurprisingly, the hosts upped the ante after going behind. Hector’s threatening free kick in the 62nd minute was well defended, but Risse came closer five minutes later when his set piece left Leno stranded but missed the post by an inch. The midfielder’s deflected shot then drew an impressive save from the Bayer 04 custodian, while Anthony Ujah contrived to head wide from inside the six-yard box in the 75th minute. Eight minutes of pressure later, and the hosts had eventually netted a deserved equaliser, with Risse’s cross nodded across goal by Ujah and converted with aplomb by Finne for his first goal of the season. The Billy Goats threatened a winner in the closing stages, with Kevin Vogt’s header cleared off the line by Ömer Toprak, but Leverkusen’s late resistance ensured a point against their rampant local rivals.